Along with Star Trek II, this is my favourite Horner score. I spent ages trying to get it and was rewarded by an enjoyable, exciting and all round excellent hour of music. The sparkling main theme goes through many variations during the score, from an understated piano version to a souped-up full orchestral version for the action scenes. The action cues are all excellent, second only to Star Trek II, admittedly they are often derived from the Horner Star Trek scores but I don't really have a problem, it's the way that Horner blends his older ideas with his new themes that is one of his strong points, not a weakness. Jenny's theme is not a romantic theme and since I have never seen the film, I cannot say for certain what Jenny's role is, but the theme is superb none the less. The two songs are actually worth listening to as they are good, well arranged and performed by all concerned. The only slight criticism of the score is the playing does occasionally get a little out of tune, especially some of the trumpets when playing in the higher registers, but that aside, it is an all round excellent score and as it says in the Gramophone Good Film Music Guide, if you want just one James Horner score, get this one, it's one of his best. 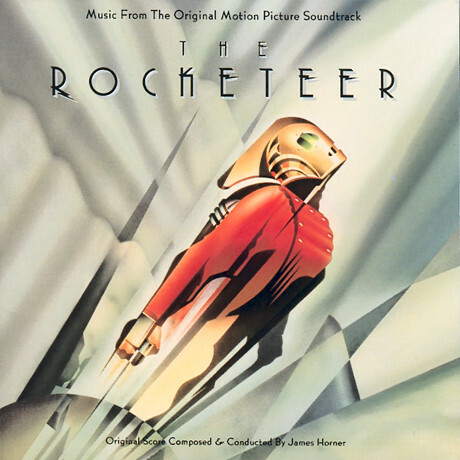 The Rocketeer is considered by many people to be one of Horner's best works, and you know, they might be right. The album opens with a peacefull pianosolo, with synths in the background, introducing the main theme. Then the whole orchestra takes over the theme and develops it. This music is perfect for the movie. It really feels like you're flying. The second track is very good, very stirring (it sort of bounces along), action music. I like melodic action music, and this really is. In the third track Jenny's theme is heard for the first time. It opens with a romantic horn, one of Horner's trademarks. The theme is then played by the orchestra in all its grandeur. This track, and theme, is really great. "Neville Sinclair's House" is quiet music, that gives a feeling of night, but also of tension (it's been a while since I saw the movie, so I don't remember when it's used in the movie). The final track starts almost exactly like the first. The rest of the track is a "medley" of the two themes, giving a great ending to a great score. It's worth noting the way Horner uses the main theme in the music. He makes it sound stirring, swell, heroic, relaxing and peacefull.